Pen shows are a great place to reconnect with old pen friends, and the L.A. Show was no exception. I had a wonderful time talking to people I'd met at pen shows and kept in touch with (via email and/or letters) over the years. 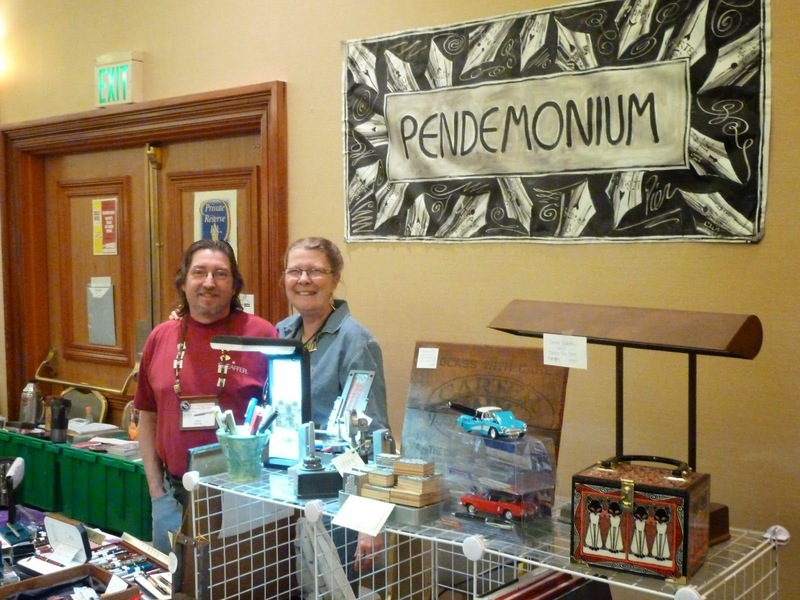 Sam & Frank Fiorella are the good folks behind Pendemonium, a great online pen store (and, until they moved to Arizona recently, a brick & mortar retail store) that has been around for a long time. 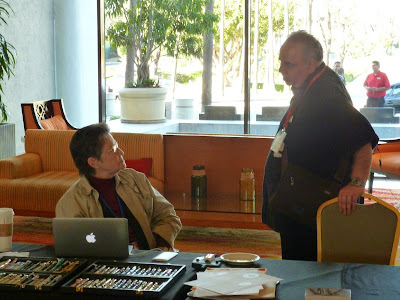 I first met Sam & Frank at the Portland Pen Show (which ran from 2004 to 2008) and purchased many things from them over the years, so it was nice to see them in person again in L.A. As usual, they brought a wide variety of items with them to the show, including print ads, books, inks and ephemera, in addition to writing instruments. 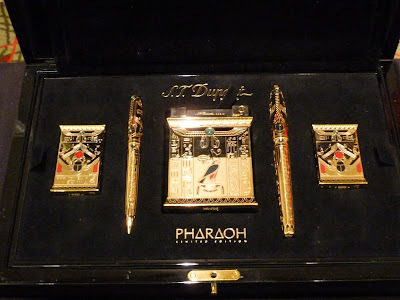 I bought a couple of really nice ads from them (and included a late photo of them in part 1 of my pen show report), as well as a book on the Parker '51'. 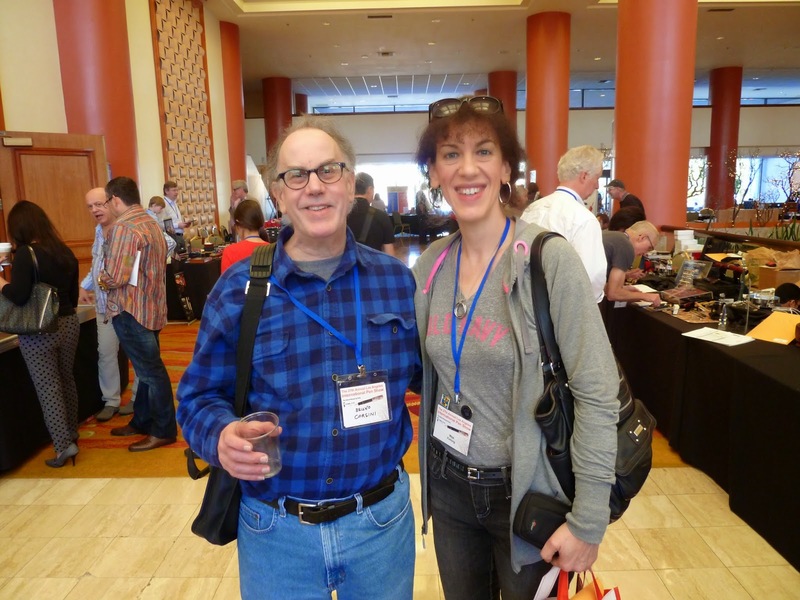 Here's me with Bruce Hirschman, the pen maker extraordinaire behind Bruno Corsini Pens. I had a great time hanging out with Bruce (whom I also met in Portland) and his friends in the Pan Pacific Pen Club (which meets in San Francisco's Bay Area) on Friday night, as well as pen people from as far away as Portugal and Brazil. Thanks for inviting me along, Bruce! A quick & candid shot of Sherrell Tyree, who runs Ink-Pen with her brother Joel Hamilton. Sherrell and Joel are super-nice people and it's always a pleasure catching up with them at pen shows. We first met at the Portland pen show back in 2004 and I've bought several pens from them over the years. 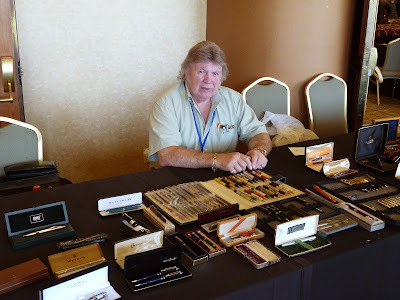 They are experts on Sheaffer and Parker pen restoration and always have lots of nice pens to sell at pen shows. Oh, and seated to Sherrell's right is Sam Highsmith, with whom I chatted on Saturday. Sam is a member of the very-active Arkansas Pen Club and is a real Southern gentleman. It was a pleasure making your acquaintance in L.A, Sam :) Oh, and P.S -- I managed to try some grits on this trip, but in an odd setting---the Amtrak restaurant on my way back home! Here's Nibmeister John Mottishaw of Nibs.com examining a client's pen. John is a mainstay at many pen shows in the U.S (I first met him in Portland, too) and is a master at repairing fountain pen nibs. He delivered an excellent seminar on Saturday that was well-attended and much appreciated. Thanks again, John! Photo above: That's Kim Sosin of Penquest talking to Sarj Minhas, who (with his lovely wife) came all the way from England to attend the show. Sarj is fondly referred to as "The One-Man Pen Show" because he always brings many, many lovely pens to sell. I hadn't met Sarj before, but I knew Kim from the Portland shows. 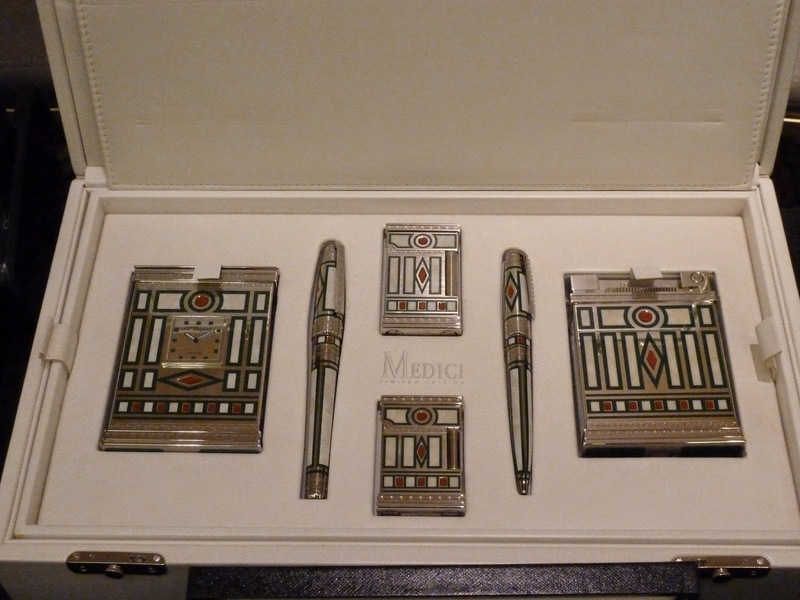 I bought my amazing Stipula Gaudi Casa Batllo LE pen from Kim at the L.A. show this year (see part 1 of my L.A Pen Show report for photos of it) and I am thrilled with it. Many thanks, Kim! 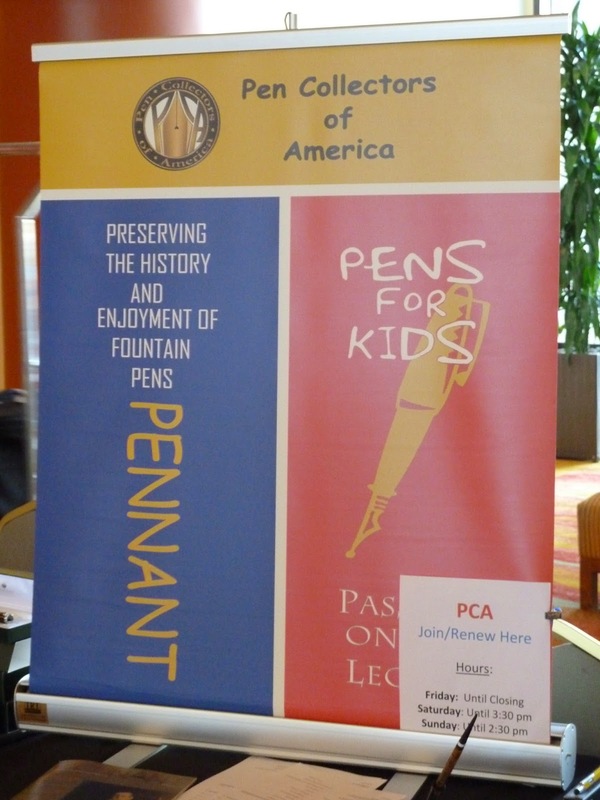 Kim is the Executive Assistant at the Pen Collectors of America (PCA) which runs a free program called Pens for Kids (PFK). The aim of PFK is to "foster(ing) an interest in pens and pen collecting in the next generation." 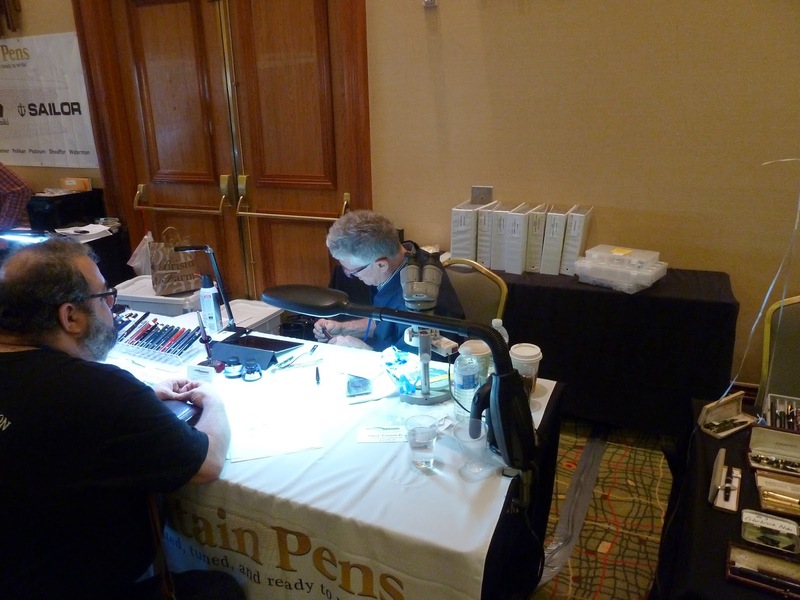 To this end, the PFK program has free workshops at some U.S. pen show which "also stress the importance of handwriting and personal expression in communication." 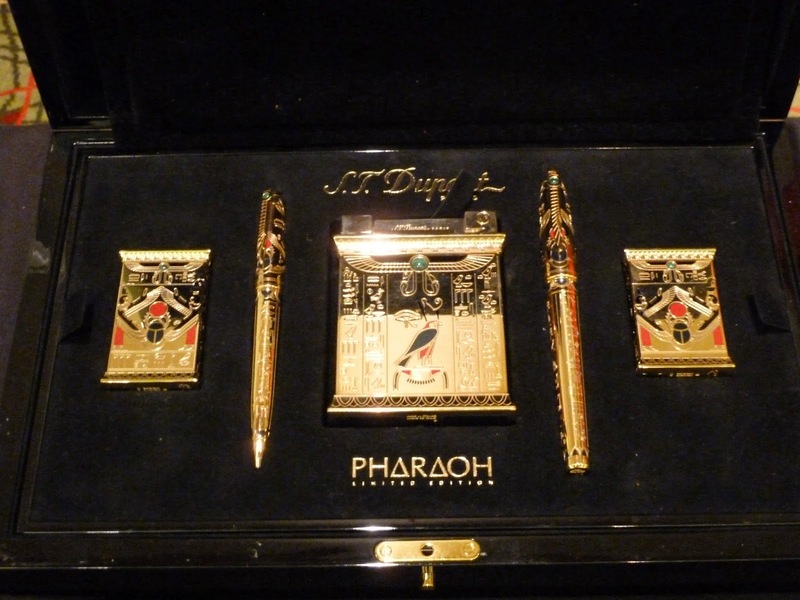 At these workshops, each child is given a fountain pen to use and then take home. 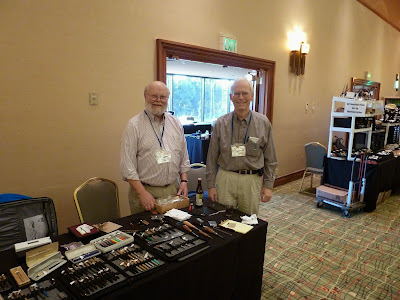 That's Stuart Hawkinson and Jim Leonard, both from the Portland Pen Club. Stuart is one of the first pen people I met at the very first Portland show back in 2004. I bought a really cool vintage Eversharp Skyline ballpoint that he converted to a modern ballpoint at that show, and I still have and use that pen. Stuart is an amazing pen repairperson and a very nice guy, so it was good to catch up with him and see what he's been up to. Last but not least....the one-and-only Dave Moffat from our own Vancouver Pen Club! I thought I'd be the only person from Vancouver there but I wasn't. Dave is one of the very first pen people I met in Vancouver and he's been collecting pens for decades, having amassed an amazing collection of both vintage and modern pens. To finish up this long post, I thought I'd end with some photos of some very special Dupont pen sets--the Medici and Pharaoh---that were being sold by Toys From the Attic, the online store from whom I bought my nice new 3-pen leather case. My photos don't really do these gorgeous works of art justice, but I thought I'd include them anyway. Enjoy! Thanks for these reports Maja, I enjoyed reading them and am only slightly jealous of your trip. Glad you finally got to another Pen Show. Thanks, Rick! 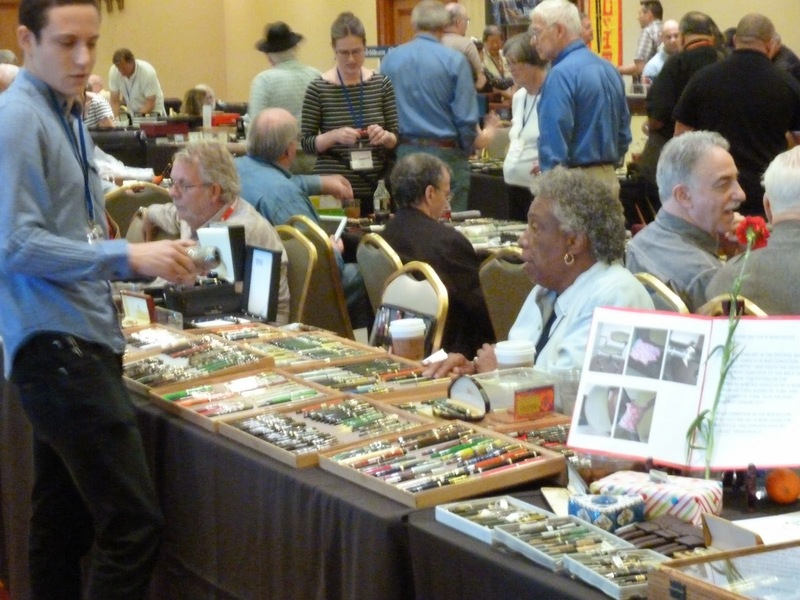 It was great to attend a pen show again; the last one I attended was 6 years ago, in Portland.